The patented features of the SUPER PORTA-GRILL® will bring you amazing results. The 1" air space between the 3/16" thick steel liner and the firebox walls provides a uniform draft under the fire grate. This creates uniform heat and an even grill temperature from end to end. Fire with Charcoal, Mesquite and Other Aromatic Wood Chips. While ordinary charcoal burns at 700°, mesquite can burn at a temperature of up to 1500°. 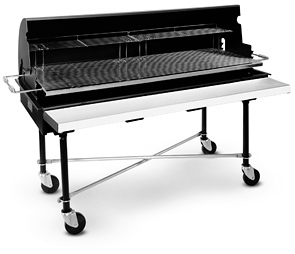 The SUPER PORTA-GRILL® is designed and constructed to handle extreme heat generated by wood fuel. The heavy-duty 3/16" thick steel liner and 3/8" steel rod liner grate protect the firebox from any potential warping or degrading resulting from high temperatures. The rugged 1/10" thick (12 ga.) steel firebox is also reinforced with 4-1/4" x 3/16" steel channels. 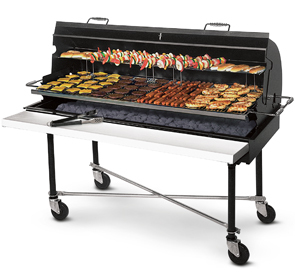 ►Need a SUPER PORTA-GRILL® M Fast? ► Items ship within 48 hours on orders up to 4 units.